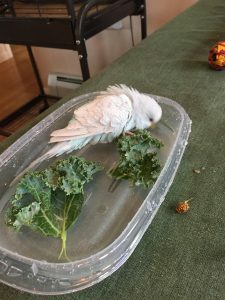 I’ve already written a post with 5 bathing methods, but I’ve found in the intervening months that there are way more bath types to try, which is great, because your budgie will probably only find one or two of them acceptable. 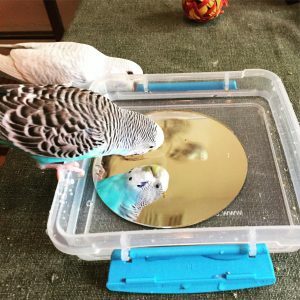 Getting budgies to take a bath can be a challenge, but the reward of your budgie getting clean and loving it is well worth the struggle. Keep in mind that you may have to offer the bath type several times over the course of weeks before your parakeet decides to give it a try. The hanging bath – hanging wet greens inside the cage can be a very comfortable way for your budgie to bathe. Not only are they in the safety of their own home, but the wet greens tap into the part of their wild brain that sees it as a very natural way to bathe. 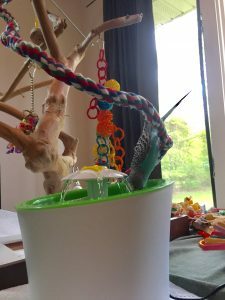 I have written a post about how to make a hanging bath, there’s a learning curve and you want to make sure the bunch is secure enough to withstand multiple budgies’ weight and quite a lot of abuse. Misting – get a small misting bottle and gently spray your budgies with water. Make sure to completely empty and dry the bottle in between uses so it doesn’t get mold. 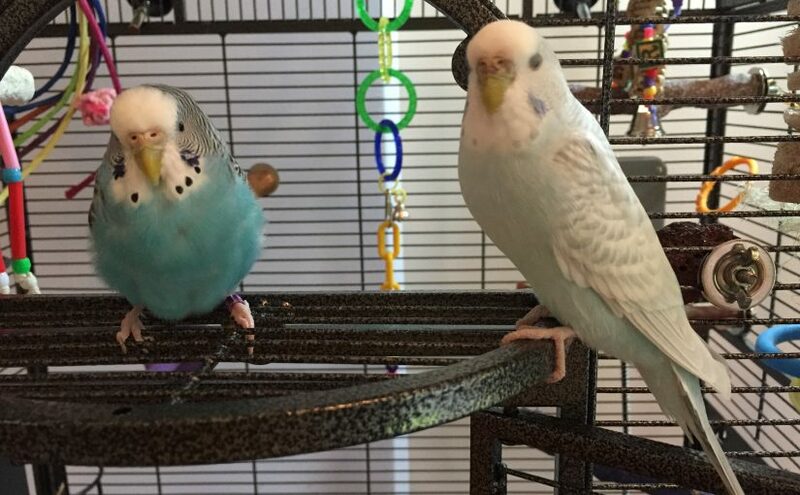 Depending on how your budgies react you can either spray lightly above their heads so they barely notice, or you may be able to spray them more directly. Some parakeets grow to really enjoy bathing this way. Not mine, so much, but I know they are out there! a. Shower perch – these seem to be mostly intended for larger birds to me, but I have heard of budgie owners showering with their birds. I think the key here is that the birds are not directly under the flow of the water but are adjacent and get a nice warm mist. b. Putting the entire cage in the shower – If you have a small enough cage, or a large enough shower, this would be an efficient way to clean both cage and budgies at once. My main cage is way too massive to even consider attempting to put it in the shower. 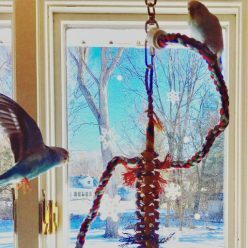 Additionally, I have a hard time imagining my parakeets dealing with all the stimulation gracefully. I also don’t know how the heck you would get it completely dry afterwards, and I think you’d have to remove most toys and perches beforehand. But, I feel like it warrants a mention because every time people talk about baths someone chimes in and says this is their go-to. Greens on a shallow plate – get some dark leaf lettuce, kale, or any other green, wash thoroughly and lay them out on a shallow plate, pour just a little water over the greens and plate. The first few times we did this I had to lure the parakeets into the water with millet but once they were there they got the picture and bathed. Like the hanging bath, this probably feels very natural to them. Cup your hands under a running sink – make sure the water pressure isn’t too hard and the water is not very hot. If you cup one hand at first and have your other hand splash around in the water it may be easier to generate interest. My budgies will sometimes go for this, but they usually just drink a lot of water and do no bathing at all! You also don’t have to involve your hands at all, but could put a shallow Tupperware, bowl or whatever they like under the flow of water. Shallow Tupperware or bowl – Either with greens or without, whatever is preferred. I offer shallow bowls of water a couple of times a week and every so often Kelly will just hop in and take a very good bath with no warning. It probably only happens about once a month but she gets completely soaked and it’s lovely. The Lixit bath – I don’t know what it is about this bath but I’ve never seen a bad review. (In fact, here’s my review). It’s easy to install and if you mount it on the outside of your cage you get very minimal water mess inside. I think the budgies like bathing high up, and apparently, they also like bathing in see through things. Cupped hands with greens – this was the first bath Toby ever took and it was entirely accidental. My mom was over and she offered Toby some wet lettuce as a snack cupped in her hands. Toby hopped on and went into full bath mode, puffed out and deranged looking. She was probably thinking “what took you jerks so long, I’ve felt so dirty”! We’d never seen a parakeet taking a bath before and briefly thought she was broken. Mirror at the bottom of Tupperware – this is a cute variation on the Tupperware and would also work with a reflective bowl. The budgie thinks that she is bathing with a friend and it may help her to get into bathing and/or feel more secure. Catit Flower Fountain – this fountain has been all the rage lately in a Facebook parakeet group that I’m a part of, so of course I had to try it too! 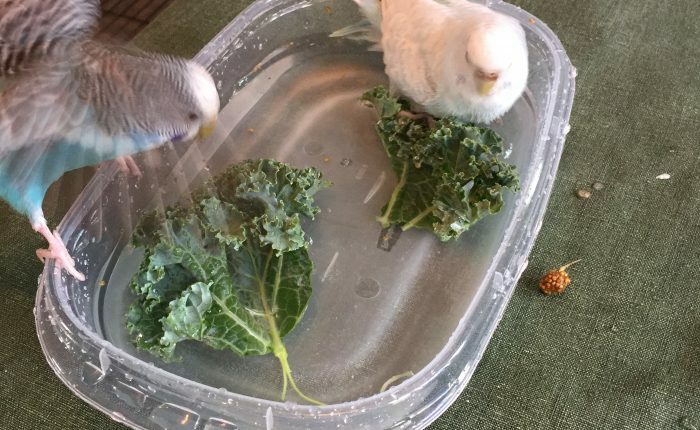 While I can’t say it was an immediate hit, like it has been for others, we definitely had some intrigued parakeets and they liked drinking out of it. I think it will take a few more exposures before I can render judgement but it was super fun to try and if you have friends with cats you could always gift it to them if your budgies don’t like it. So there we have it, the extended bath ideas list. I’m guessing that 6 months from now I’ll be posting an update with 20 unique bath ideas! Good luck to everyone out there in getting some cleaned up budgies, don’t let their resistance get you down, just like introducing vegetables and fruits it can take a long time for parakeets to get over their initial trepidation and get down to enjoyment. Patrick and I realized recently that our entire central air system has to be replaced. Patrick went up in the attic one day to try and clean out the air handler, and when he realized it was full of mold (!!!!) the decision was made for us. Especially with the parakeets and the increasingly hot summer weather here, we feel like we have to have the AC. The only issue is, the job takes three days, and the budgies most definitely have to decamp for the length of the job. I hadn’t ever thought about how stressful moving parakeets would be, but I’m certainly feeling it now. Originally I wasn’t even thinking along the lines of having to move them at all, but we are going to have the ductwork and the vents shifted so the whole system will be more efficient, and that means cutting new holes in the ceiling, and not just generating a ton of dust, but also probably contaminating our main floor air with the ceiling air, which is highly suspect! Even without the air issues, there will be a lot of activity and noise in every area of the house, and keeping them in a state of high alert and fear for three days just seems cruel. I am crazy lucky that there wasn’t even a question of where they would go. While the sales rep was still talking to us about our various options I was speedily texting my mom to make sure the budgies could have her guest room for a short stay! She has cats, but they can easily be shut out of that room, and I LOVE that she doesn’t burn candles or use any plug in fragrance or incense etc., which would be a huge deal breaker for budgie visitors. Of course since she said yes I’ve been panicking about being separated from them, which is crazy because I travel for work and we’ve vacationed before and my mom has taken care of them in our home! All sorts of crazy thoughts about what if they have a night fright and she doesn’t wake up, or what if the cats break in and knock over their cage? I could “what if” myself into a padded cell on this one, and I’m sure all the while the parakeets would be totally fine and probably enjoy the change of scenery. My mom even offered to let me stay over and sleep in the room with them, but since they go to bed at 7pm I think I’ll be fine staying at home! 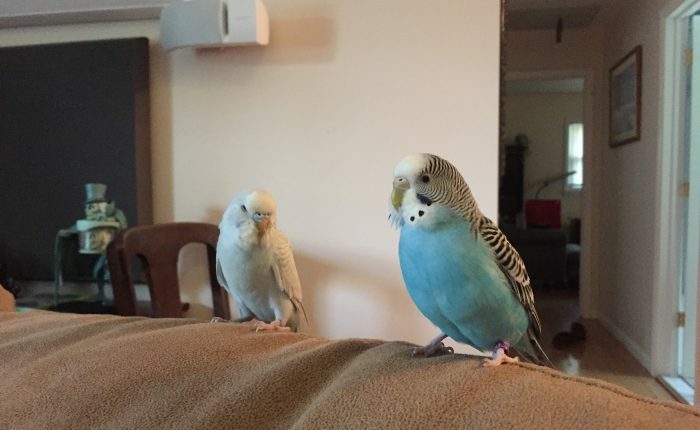 So, in the coming weeks I will be away 2 nights for work, then the parakeets will be away 3 for the AC, then Patrick and I will go for 5 nights on vacation, and we’re using the pet sitter for the first time. After all that I’ll be ready to camp out near their cage and never leave home again or let them go anywhere! As much as I wish I could keep them with me the whole time, I am so grateful that they have somewhere to go that’s safe and clean and where they will be cared for diligently and interacted with as much as they are at home, if not more. I am generally a no muss, no fuss kind of person about my personal care routine. Also, because of my husband’s severe allergies we don’t use many products with scent. Even before parakeets we didn’t have candles, potpourri, plug-ins, Febreeze or any other home fragrance products. We had also cut out harsh chemical cleaners and started using Seventh Generation Free and Clear All Purpose Cleaner, 32 Fluid Ounce to clean in addition to Mr. Clean Magic Eraser Extra Power Home Pro, 8 Count Box , which are a modern miracle. We also only use unscented laundry and dishwasher detergent, dish soap and hand soaps. There’s no perfume in the house or scented body products, including all face and hand/body lotions and we don’t use any hair products at home beyond shampoo and conditioner. So, we don’t have hair gel, spray or any other hair treatment products. The only exceptions to the rule are Avalon Organics Clarifying Lemon Shampoo, 11 Ounce and AVALON COND,CLARIFYING,LEMON, 11 FZ , which had to happen because unscented shampoo/conditioner are just unpleasant, and also Oleavine Antifungal Soap with Tea Tree and Neem for Body, 12 oz , which is a tea tree soap I am just absolutely obsessed with. Something might sneak through occasionally that has an oatmeal or mint scent, but by and large our house is scent free. 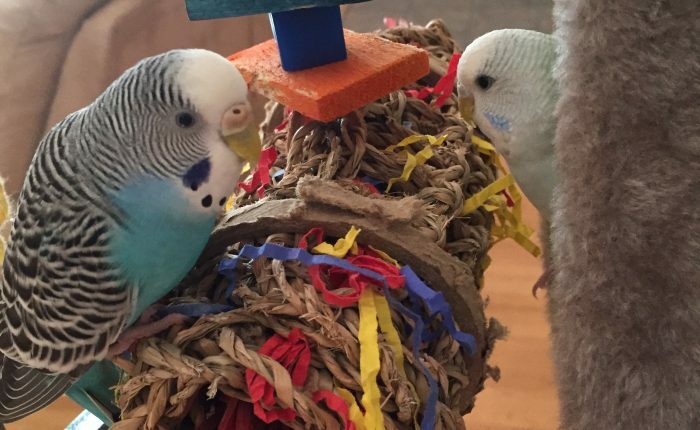 Scents and home-fragrance products can be very bad for parakeet health, they cycle air through their bodies much faster than humans, and can be irritated by air contaminants just like people can. 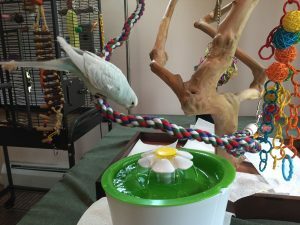 We had already installed a few Winix U300 Signature Large Room Air Cleaner with True HEPA 5-Stage Filtration, PlasmaWave Technology and AOC Carbon around the house for my husband’s health, but they are also recommended for parakeets and other birds. 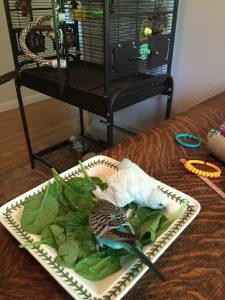 I think we had a much easier time eliminating products before getting parakeets since we started out unscented; the only thing that was hard to part with were our non-stick pans. I’m sure there are people who say they used teflon with parakeets and the ‘keet lived to be 30 years old and was never sick a day in its life, but who doesn’t have an Aunt Myrtle who smoked since she was 11 years old and lived to be 150? I mean, obviously hyperbole, but the exceptions don’t really entice me to chance it. What prompted me to write this post is my one personal grooming vice, and that’s getting highlights. I get them done about every 8 weeks and it was always sort of a big issue because Patrick can’t handle the chemical aftermath, but now with the parakeets I feel even worse coming home after a bleaching! I asked my stylist if I would be damaging my hair by washing it the same day as getting it colored and she said no, so as soon as I get home from the salon I hop right in the shower. That cuts the chemical smell but it’s still pretty heavy, so I usually throw on a knit cap (much more comfortable in winter!) before letting the birds out. Toby is constantly on my head and Kelly loves grooming hair too, but I take every precaution to keep them away from my hair for at least day 1, and then after washing again the next day it’s usually so faint that I feel like I’m not a danger to anyone. Should I stop highlighting my hair? Probably, since it causes my husband discomfort and potentially is bad for the parakeets. Still – I’m not quite ready yet. 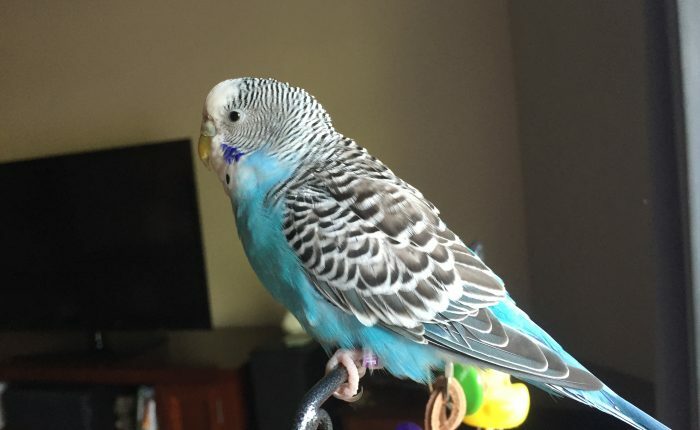 I’d love to have some comments from other bird parents- what products do you use and does anyone else feel they can’t live without hair color? If so, what precautions do you take (if any)? Feel free to tell me I’m a lunatic and should stop worrying about it!